New York is by far the most exciting city on earth and one of the greatest when it comes to coincide with the Christmas it is incomparable with anywhere else in the world. 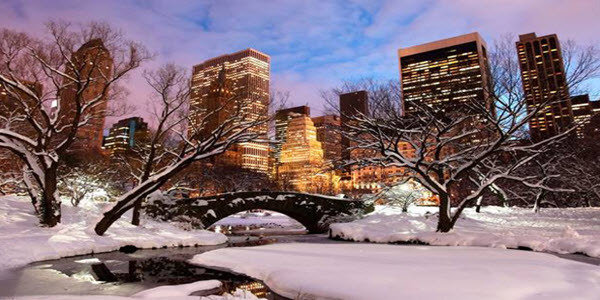 There is no other city like the Big Apple during the holiday season, adults get to enjoy shopping in some of the biggest shops, Broadway shows are line-up and no other mood-lifter works as well as Central Park. The out-of-towners may get New Yorkers to grit their teeth, but even then, they realise that no-one can resist the magic in the air. There is just so much to feast your eyes on that it’s impossible to paint the real picture in words. The most brilliant atmosphere to skate in is at the most iconic rink in New York, and you get to enjoy the Rockefeller ice rink at very affordable prices. During the holidays you can also enjoy cookies and hot chocolate in the VIP tent, and then there is the 30m Christmas tree that keeps your attention for hours. Whether you are a shopper or not, the window displays at Bloomingdale’s get everyone to stop and appreciate this impressive art form. Every year the displays are based on a specific theme, and the techniques used are unlike you’ve seen anywhere else. One of the shops you simply can’t walk past is Macy’s, passing by is bound to get you to stop and enjoy the displays for a while, but should you step in, you’ll be pleasingly lost in a Christmas wonderland. The place to be is Time Square in New York! The recurrent Christmas show is the NYC Ballet’s performance of The Nutcracker, and it has been since 1954. Performed at the Lincoln Centre and notwithstanding its longevity, the show, now a huge success, first became this popular after it was televised in 1958. This time of the year, New York offers the best Broadway family shows, which almost always include SpongeBob Square Pants and Charlie and the Chocolate Factory. One of the most exciting shopping sprees would be by visiting Macy’s, while it is no secret that New York is not cheap, depending on where you’re travelling from the exchange rate could further increase your expense. But there are many ways to cut costs and enjoy the best Christmas ever: you get to go anywhere via the subway, and if you spend a day or night in Manhattan the hotdog stands do sell the best food at the most affordable prices. You don’t need much as the flashing billboards, and fantastic Christmas decorations are more than enough to provide you with a lifetime worth of memories, and you get to visit all the biggest attractions with either a CityPass or 7 Day Unlimited Subway ticket. Known for its ability to create the best songs about America, Country music have been responsible for creating protest tunes, patriotic anthems and country artist are known for singing about home sweet home. 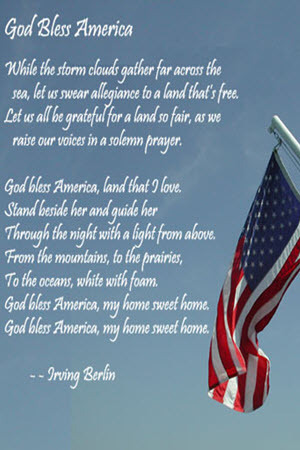 The large variety of song about America have been inspired by love, others by current events and it has allowed so many artists to achieve their dreams, one thing that does connect all the songs is the passion the artists have for the USA. Compiling a playlist for your holiday or some of the road trips you plan in America can include music from several different genres, there are a few go-to songs about America that no playlist should be without. While we loved listening to all of them, we finally did decide on the three most important songs you should add to your playlist before grabbing your bags to travel to the USA. Only in America by Brooks and Dunn released only a few months before the 9/11 attacks, its reached extended during a time of devastation and its inspiring and energetic tribute to the everyday life of Americans continued to promise hope for the future. Music critics feel the song is a declaration that America is the country where everyone gets to dream as big as they want. The song “Only in America” has since been used in a major way in the political arena on both sides, it featured in the 2004 re-election campaign of George W Bush, and it was also the music played after the acceptance speech of Barack Obama in the 2008 Democratic nominations. Co-written by Brooks, “Only in America” reached number one and for the duo, it was a major success. It’s basically impossible not to think of Toby Keith when it comes to songs about America, his most popular “Courtesy of the Red, White and Blue”, some calls it, The Angry American song. The artist built his career basically on attitude-driven patriotism, one of the biggest songs released in 2002. This song hit the nerve and gave the community the worlds they needed to process their feelings, feelings such as that brought on by 9/11. The one emotion American’s could identify with was that of anger, it was a way to deal with devastating sadness. It is something that Toby Keith felt as well. He knew it would find favour, that it would offer that what listeners wanted to hear at the time. As a number one hit, Courtesy of the Red, White and Blue now stands as the most honest depiction of the attitude of the people during the darkest time in the history of America. Without “God Bless the USA” your playlist would simply not make sense, and this song by Lee Greenwood is the one tune that stood the test of time. It first released in 1984 and was re-released in 2001, shortly after 9/11. When it comes to romantic cities most people think of Venice the city with the gondola-clad canals, other instantly think of the home of the Eiffel Tower, Paris, but those living or visiting the US have no reason to search for romance by crossing the ocean, there are plenty of romantic cities in the USA. Never lost any of its lustre, Palm Beach once was the playground of the high society, but all that has been traded for a relaxed island holiday resort style feel and at the same time nothing could be more romantic. 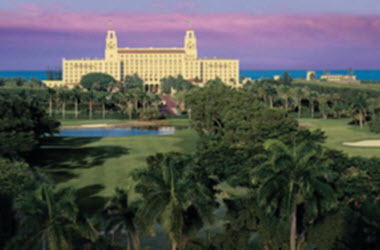 It is still home to classic events like the PGA and polo, but it is far from the Palm Beach it was yesteryear, the 47 miles of sandy beaches framed with resorts set the perfect destination to enjoy candle dinners at one of many oceanfront restaurants and reconnecting with your partner. 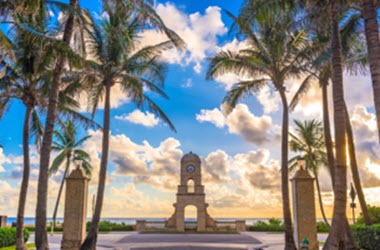 Palm Beach, Florida is perfect for everyone, including the romantic history buff, the romantic food lover, romantic water loving couples, and those who just want to leave it all behind and enjoy each other’s company. Long walks and magnificent sunsets on Florida’s beaches is all you really need to enjoy romance, but should you wish to show someone just how much you care than spending a bit of time in planning a great schedule could be just what your break-away needs. A great way to finally get rid of the at-home stress is to book a great golf session for him while she gets to enjoy pampering at a luxurious spa. If you both play golf, then your break-away could start by scheduling some golf followed by spending the rest of the day in slippers and a robe in-between dips in the mineral pools. Seaside glamour and unapologetic luxury await in the Breakers Palm Beach resort, built originally in 1896 by one of the greatest industrialist Henry M Flagler. The only downside of the Breakers is that neither of you would ever want to leave again as its panoramic views of the coastline is unbeatable, and if you climb to the very top of Jupiter Lighthouse, you enjoy a view from this historic lighthouse which is 105 tall.